Medicine is a tough discipline. To get where you are today, you had to put in a lot of hours, and be determined to stick with it. It’s the same with money. If you want to be a successful investor, you have to get a financial education. Make It, Keep It is a financial primer. 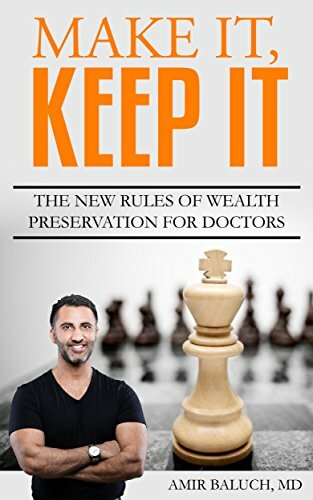 In it you will find chapters on wealth preservation and attitudes to money, budgeting, debt reduction, financial vehicles, the principles of investing, methods to keep more of what you earn from tax avoidance, pensions, and insurances to asset protection and estate planning, and how to take action and put what you’ve learned into practice. Dr. Baluch founded Baluch Bulletin to share his personal real estate and investment experience and expertise with his physician colleagues from around the globe. Dr. Baluch and his team have closed over $450 million in real estate transactions over the past five years and have more than 200 years of combined experience in Texas real estate. In addition to being a successful real estate investor, Dr. Baluch is also a licenced realtor, owner of Investment Club Realty, LLC, holds series 63 and 22 securities license, and is board certified in Anaesthesia.